I do miss my Toronto go- to stores, but grocery shopping in New York has been really fun. There is so much variety of innovative organic, vegan, gluten free products. I’m also really close to Eataly, which has great produce. They have beautiful lettuces such as heritage gem lettuces, variegated radicchio, and containers of just mizuna lettuce. A few things I’ve never seen in Toronto. They also had baby corn in the husk and fresh chickpeas. I was definitely inspired. Lately I’ve been eating a lot of salad, which has surprisingly become a new habit. I’ve been eating particularly healthy these days and my body continuously craves something fresh and green. 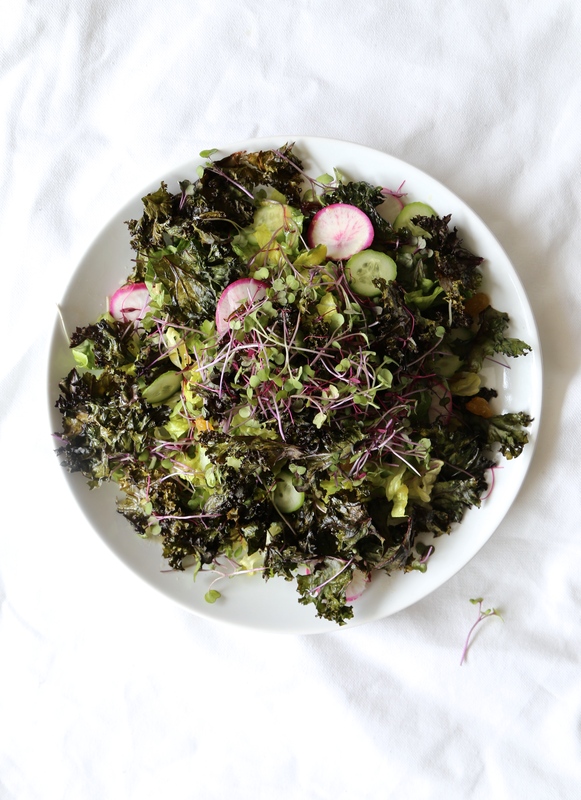 This recipe for ‘Spring Salad with Crispy Kale + Miso Vinaigrette’ is great because it’s light and refreshing but the crispy kale adds that crunch that we all crave when enjoying a salad. Can kale chips be the new crouton? Preheat oven to 400°F. Dress the kale in olive oil and sprinkle with salt. Arrange in a single later on a baking tray. Bake until crispy about 15 minutes. Make the dressing, whisk together all of the ingredients. For the salad, combine all of the salad ingredients but the crispy kale. Toss with enough dressing to lightly coat the salad greens. Gently mix in the kale. Divide amongst 4 plates and garnish with more micro-greens. Serve immediately. This entry was posted in Salads and tagged cucumber, gluten-free, kale, kalechips, microgreens, miso, organic, radish, salad, Vegan. Bookmark the permalink. This is everything i need on a plate coming into spring! More greens plz!